Specifically PIMCO Women has a mission to advance a meritocratic, gender and cognitively diverse culture by partnering with colleagues and business units to help recruit, retain and develop women at all stages in their careers - all for the benefit of our clients, our business and our employees. We believe diverse perspectives generate deeper insights, drive greater innovation and yield better outcomes for our company and for our clients. We seek to engage and partner with external organizations with similar objectives of advancing women in the financial services industry. 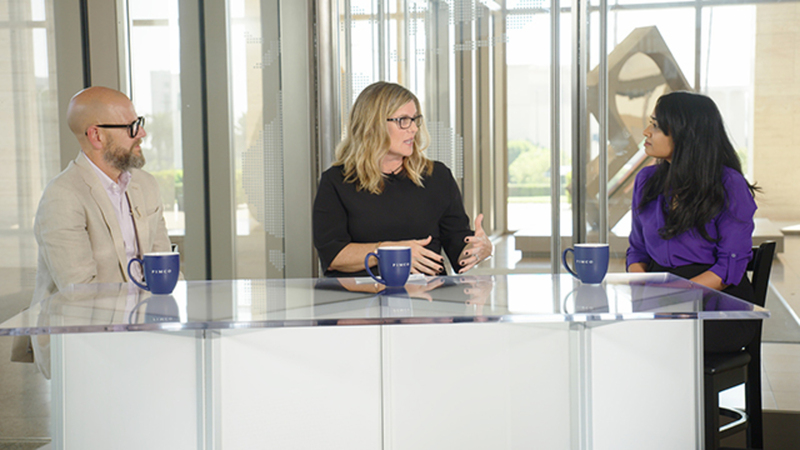 Learn more about how PIMCO is investing in the talent pipeline of our firm and industry to bring more women into portfolio management and leadership. Seeking to heighten employees’ appreciation for diverse perspectives and skills. Statements concerning financial market trends are based on current market conditions, which will fluctuate. All investments contain risk and may lose value. No representation is being made that any investment strategy will or is likely to achieve its objectives.